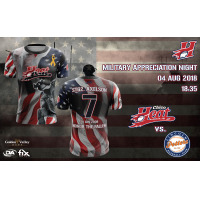 Chico, CA: Every year, the Chico Heat hosts a "Military Appreciation Night" where we wear a specialty military-themed game jersey and auction them off to the fans after the game. The proceeds from our jersey auction are donated back to local military non-profits. This year, the date and time of our Military Appreciation game is August 4th, 6:30 pm at Nettleton Stadium in Chico, CA. We are expecting a crowd of 2,000 plus fans along with a group of special guests from Beale AFB, home to the 9th Reconnaissance Wing. The game will be followed with a spectacular firework show brought to you by Golden Valley Bank. This year's celebration we will be honoring fallen soldiers specifically from Northern California. We have chosen 27 fallen soldiers from World War 1 through the Afghan War to be honored on this special night. As a tribute to each soldier, on the back of each Heat player's jersey will be the name of one of the 27 soldiers, with their rank, and date that they fell. We will create two sets of commemorative jerseys designed by Dialed In Athletics of Chico, CA. These are one-of-a kind, patriotic jerseys that were commissioned by our game sponsor Fix Auto. One set will be set aside for the families of the fallen soldiers and the other set to be worn during the game by our players and auctioned off to fans after the game. Our goal is to raise somewhere between $3,500- $5,000 dollars from the event. All proceeds raised from the jersey auction will be donated to the American Gold Star Mothers, Dept of Northern California organization, a private organization of mothers who have lost a son or daughter in the service of our country. In addition to the jersey tribute, Chico Noon Rotary has produced 27 sets of dog tags with the names, rank, and dates fallen of the soldiers that will be handed out to the first 1500 fans.